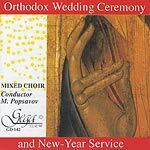 Orthodox chants wedding ceremony and New Year service performed by Mixed Choir. Soloists: Hristo Kamenov - tenor, protodeacon Stefan Markov. The psalms glorifying God and Jesus Christ are arranged in the order required by the canons. Most of the melodies, of ancient origin, have been arranged by Russian and Bulgarian composers. The most popular among them are Mnogoletie (For Many Years) and Dostoino est (Meet It Is), which have also become concerto pieces in the repertoire of the Slavic male choirs. The CD is of interest for everybody who would want to look into the world of Orthodox music, the ancient roots of which are in the Byzantine chant and service. Later on, in Church-Slavonic singing there were not only transferred canons, troparia and various jubilation modulae, but new chants were also created on the basis of Bolgarskii rospev and the so called znamenii chant, elements of which are present in some of the works included in this release. 1 Come from Lebanon, bride 1'32"
3 The great litany 7'33"
4 Prokimen. Hallelujah. Glory. 2'34"
6 Rejoice Isaiah, Holy Martyrs 2'18"
7 Meet it is 1'51"
8 For many years 1'40"
9 The great litany 8'39"
10 God Lord .Troparions. 3'57"
12 The Litany of Supplication. 6'16"
13 Te Deum laudamus 6'51"
14 For many years 1'56"